did things to me, watching him perform, that shouldn’t happen to me while watching a complete stranger on stage. Alright, maybe it was just the scene as a whole, but damn. For some reference, here’s a couple of the absolutely horrible photos I got with my camera phone, so you can see the seats we got. We stood in line for a couple hours after meeting Jesse and Yolanda, who had been in line for at least an hour or maybe even two. We ended up with excellent seats and got wristbands so we could have been on the floor if we wanted. I didn’t want. 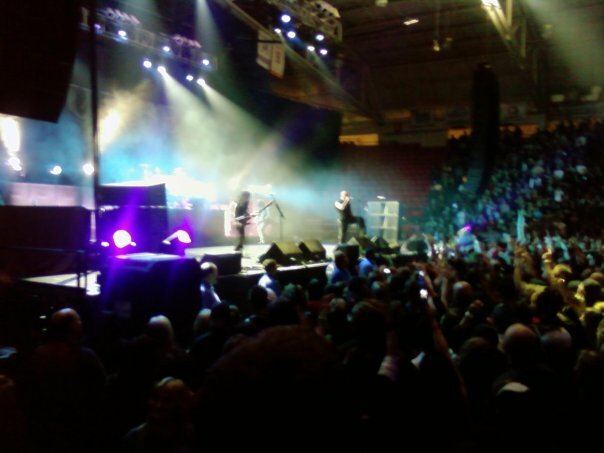 Pete and Jesse apparently did want, though, because they stayed down there for the whole concert – two bands (Skindred and Sevendust) in addition to Disturbed. The concert was great. Granted I didn’t hear every song I wanted (but then again, I know just about every song they’ve ever done and like they’re going to play four albums live…) and I’m pretty damn sure they played most songs at, like, 90 percent speed… it was still a great show. I can mark that off my list of things I need to accomplish in my life. Now I just need to see Godsmack and I can die happy. And, you know, get married and make babies and all that stuff. 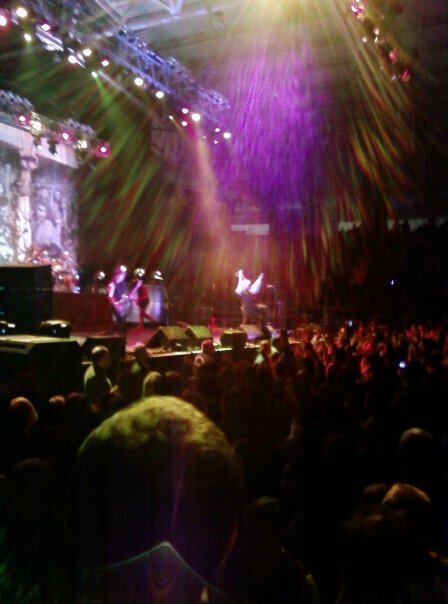 But mostly just see Godsmack. It looks *awesome*! I am still mucho jealous! 😉 I’m glad you had a great time! OOOH, his piercings are crazy, and intriguing in a “I might want to jump him” kind of a way.